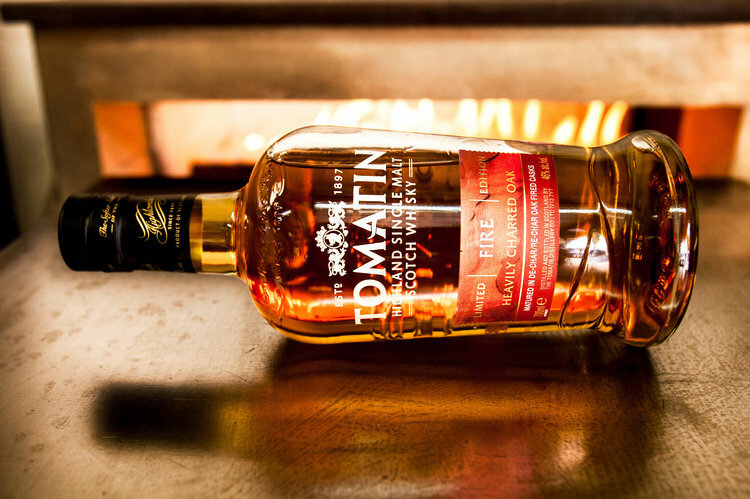 Tomatin Whisky - Fire — NORTH BLOG. We were up and ready to go, bright and early. The sun was shining, birds were chirping and it was beautiful with stunning views looking onto Dornoch Firth from the campsite. We made a nice hot brew then went for a nice walk along the sandy beach. After our morning walk we hopped back into the (Cairngorms Camper - pictured below) camper van for a short drive to Tain, which is one of Scotland’s oldest Royal Burghs with over 950 years of Scottish history. It was founded by the Vikings, and Robert The Bruce’s family hid here when he was in exile. We couldn't of asked for a better day as we made our way to Glasstorm where we would be partaking in glass blowing, which would be a first for myself and Jawn. We parked in the carpark, then made our way around to the front of Glasstorm studio to see that they had already been blowing glass since 6am. The setting was gorgeous, they had an open plan style studio that you could see right into from the streets, it was amazing to see. The town of Tain is a very beautiful picturesque town in the Scottish Highlands and having one of Britain’s top glass blowing studios is a major perk as it is a gem within itself. Brodie Nairn and Nichola Burns are the exceptionally talented duo who have made Glasstorm world renowned for their unique style and talent in glass blowing. As we were watching the glass blowing take place from the streets, Brodie shouted out “We are expecting you guys, come on round”. We made our way through the front doors and again more good vibes are felt flowing in the studio, and it is great to be around such raw creativity. We were greeted with a warm welcome (no pun intended) and an introduction to glass blowing by Brodie. He shared with us all of his experience, giving us an insight into the world of glass blowing, the techniques and answering every question we could come up with. After a morning in such a relaxed atmosphere chatting with Brodie in the studio telling him why we were doing this adventure, he then said “l think it’s only right that we get you guys to make your own whisky glass”. I instantly thought that would be amazing, great idea. I am in. It sounds silly to some, but this was like a dream come true for me as I had always wanted to attempt glass blowing and to do it in my homeland Scotland was very special for me. The precision and detail that goes into the art of glass blowing definitely is an element of its own, bear in mind this was about understanding the elemental aspect of our Tomatin FIRE Whisky. It is not everyday that you get to do something like this and considering how much glass is used nowadays it’s a very important to see how we as humans utilise this eloquent material. Being in the studio, checking out the space and watching Brodie do his work was a very cool experience as it was, let alone having the opportunity to try to do it ourselves. He made it look effortless, the studio was roasting hot with all the furnaces burning. The amount of heat they gave off was insane. From learning all we could from Brodie who was showing us techniques, to learning how to handle the tools used and of course also being cautious of anything hot, it was a lot to process, especially as the next thing we were doing was making sure we remembered it as we were being put to the test making our very own glass! Seeing how the hot glass is treated by the fire, how it moves when it comes out the furnace, how we handled it with the tools used, the scent filling the air in studio, the reaction of how the heat in the air felt on my skin, the colours coming off of the red hot glass, and the feelings that ran through me when I worked the glass creating, it was all very euphoric. I could instantly understand why Brodie loves glass blowing, there is something very relaxing about handling red hot glass working with it in ways creating a natural beauty, watching the heat creating this dancing masterpiece, firing it up and putting life into it. I had learnt, felt, seen and experienced first hand how strong the power of fire is and how everything is broken down into a finer detail. 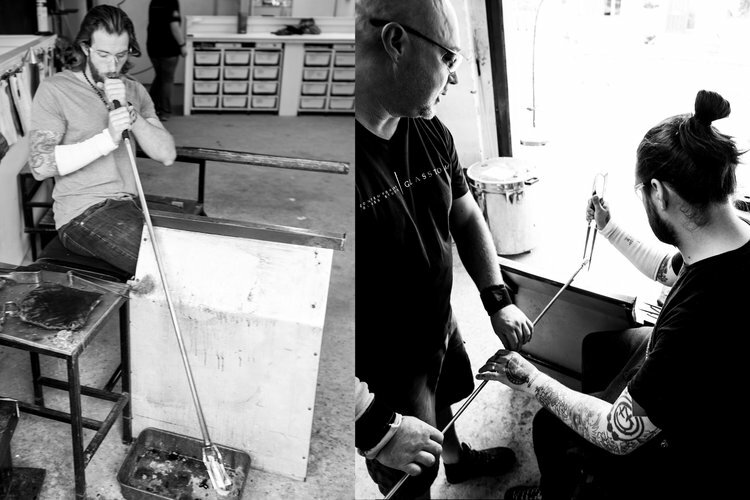 Creating my very own glass was no easy task but Brodie was there guiding me, watching me, helping me perfect the glass in whichever way best represented me. There was no expectations but living in the moment creating a thing of beauty that l can enjoy for the rest of my life. I was very happy with my glass, it wasn't technically perfect, but to me it was as I will always remember the process and feeling of creating it and the memory associated. After myself and Jawn had the chance of creating our very own whisky glasses which I highly recommend trying if you get the opportunity, it was now the moment of elements. l wanted to use my glass to drink Tomatin Fire Whisky but it needed time to cool, so another whisky glass had to do. I was even more excited now about drinking the whisky, from what l had experienced today I had an idea this was going to be a real insight of understanding the fire connection to whisky that I had never realised before. I poured myself a wee dram, then after I took in the scent, I could feel as if the blood pumping through my body was on fire, what I was smelling in the glass felt vibrant and I could almost taste it. Then as I took a drink it was almost as if I was taking a sip of a hot brew, it was spicy and there was a kick of heat in there, I could really feel the fluidity of the Tomatin Fire Whisky running through my veins heating me up with the same euphoric feeling I had experienced while making my glass, I felt a warm rush, heat, my skin was tingling around my lips, the drink felt alive! Our experience at Glasstorm was unforgettable and l cannot wait to try glass blowing again and some more Tomatin Fire Whisky. 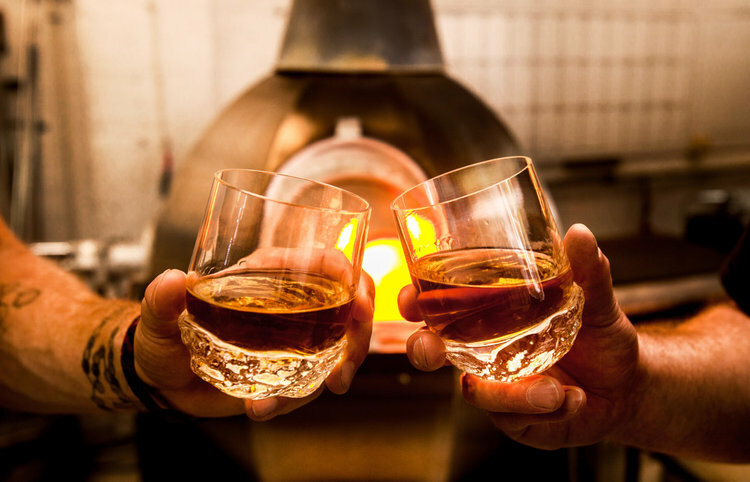 Scotland is full of surprises, I would have never thought the beauty of glass blowing would cause fire to ignite in me this appreciation for a whisky in a complete different way. So far the connection of the whisky names to the first two elements have made complete sense when tested. It is amazing how we under appreciate some of the simple things until we have moments like this. Blessed.